This is a tee section that is used with the Selkirk Heat-Fab Saf-T 6" liner system. It is made of 316-alloy stainless steel and is available in sizes from 5" to 8". The Saf-T system includes the use of Saf-T Wrap insulation, a metal jacketed ceramic blanket insulation. When the two are used together, a 1" clearance to combustibles is allowed. 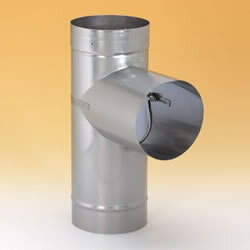 When installing a chimney or chimney liner, make sure that the components are designed to work together and that they are being installed according to all applicable safety codes and regulations.